A native to Europe and Asia, the spotted knapweed has become a serious problem in pastures and rangelands of the western lower 48. **Spotted knapweed can be confused with Alaska’s native diffuse knapweed (C. diffusa). The native diffuse knapweed has spine-tipped bracts, not comb-like tips on its bracts. 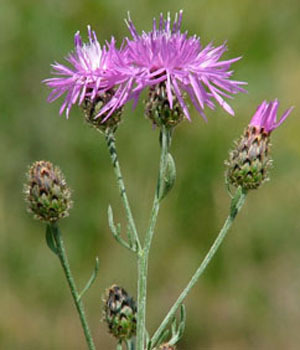 Spotted knapweed often forms dense stands in natural communities decreasing diversity of native vegetation, and degrading the forage quality for wildlife habitats. Spotted knapweed has allelopathic (toxic) properties, also reducing the native plant communities. Infestations have also been shown to increase the erosion of topsoil, further altering the surrounding habitat and natural system. Due to its growth habits and environmental habitat, Alaska’s agricultural areas could be greatly impacted by spotted knapweed if not managed both with inventory and eradication. The effectiveness of Early Detection and Rapid Response (EDRR) for known spotted knapweed infestations in Alaska has reduced the number of sites to less than 10 from the previous 23 sites. In 2013, only a single plant was found at a managed site near Sutton in which used to have over 500 plants in 2012. In Fairbanks, only one plant has been found, and managed growing along a rock filled ditch. With continual surveying, monitoring and response to spotted knapweed, it may someday be completely eradicated from the state. Early Detection and Rapid Response (EDRR) works! Controlling the spread of spotted knapweed is crucial to protecting Alaska’s native plants. If found, call 1-877-INVASIV. Presently infestations of spotted knapweed in Alaska are mostly managed manually by digging or pulling individual plants. This has proven effective in Alaska because infestations are small (>0.5 acres). Spotted knapweed also does not have creeping roots, allowing manual management to be effective. If larger infestations are discovered, long-term control requires a combination of grazing management (to prevent the plants from going to seed), herbicide use, and possibly biological control. Areas should also be monitored for several years because seeds of spotted knapweed can remain viable in the soil for up to five years.